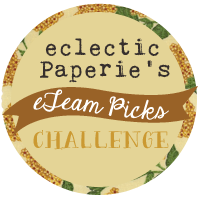 Hello everyone, Giovana here today and I am so excited to be hosting the eTeam Picks Challenge this month. I love water coloring, it's like a relax therapy for me, seriously!! So talking about a relax therapy, I inked a brand new image by Catherine Scanlon Designs "Joy". Start with a piece of Distress Watercolor Cardstock, stamp the image with Jet Black Archival Ink, then mist the cardstock with water and start coloring it Distress Inks. I just add some ink to an acrylic block and take the ink with a pen brush. For the frame I used Tumbled Glass; for the flowers I used Worn Lipstick, Victorian Velvet, Barn Door; for the leaves I used Peeled Paint and Forest Moss; for the center I used Antique Linen and Vintage Photo. I set aside to let it dry. 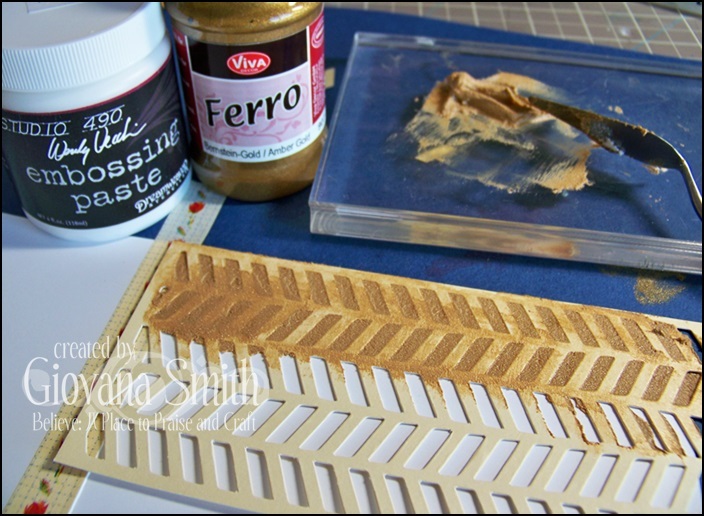 When paste/paint is dried, add a piece of blue cardstock to your card front, tie Denim twine. Stamp sentiment on dried image in Coffee Archival Ink, the sentiment is from Strictly Sentiment by Wplus9. Add image to front of card with foam adhesive. Distress Inks by Ranger: Tumbled Glass, Worn Lipstick, Victorian Velvet, Barn Door, Peeled paint, Forest Moss, Antique Linen, Vintage Photo. Archival Inks by Ranger: Jet Black and Coffee. Now it`s over to you . . . go on, go get your crafty hat on and have some fun. ll of those who play along with our challenge will be entered into a prize drawing for a $15.00 gift certificate to the eclectic Paperie store. -If you’d like to be considered as one of our featured projects and be entered into our prize drawing, please be sure to add your link no later than 6pm EST on Thursday November 6th. 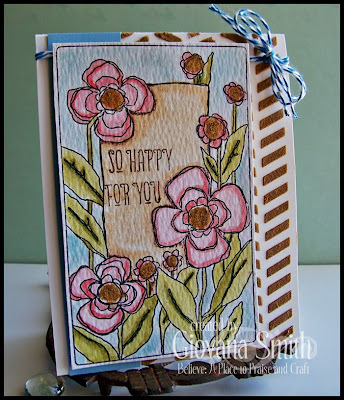 lovely creation, I like the colors and the texture added with the stencil !! BEAUTIFUL, Giovanni! 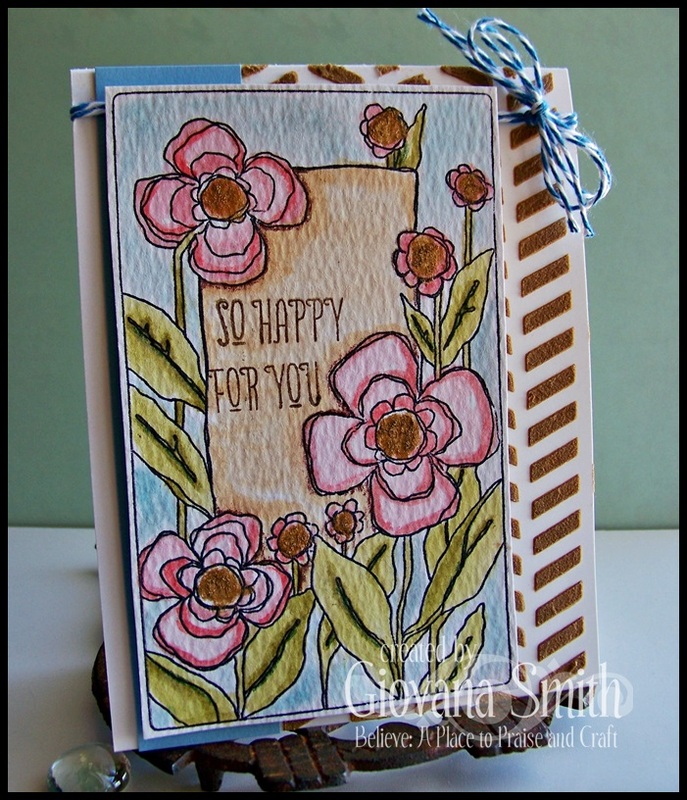 LOVE how you colored those flowers and added the touch of gold molding paste design with the stencil! FAB card! Giovana, your watercoloured flowers look wonderful. The palette is so gentle and pretty. Love the contrast with the stencilled background. The linear pattern, gold colour, and awesome texture are fabulous next to the delicate curves and colours of the image layer. This was a fun challenge...thanks! Wow, your flowers look awesome! LOVE that soft "water-color" look. I'm so playing along this weekend!!!!!! 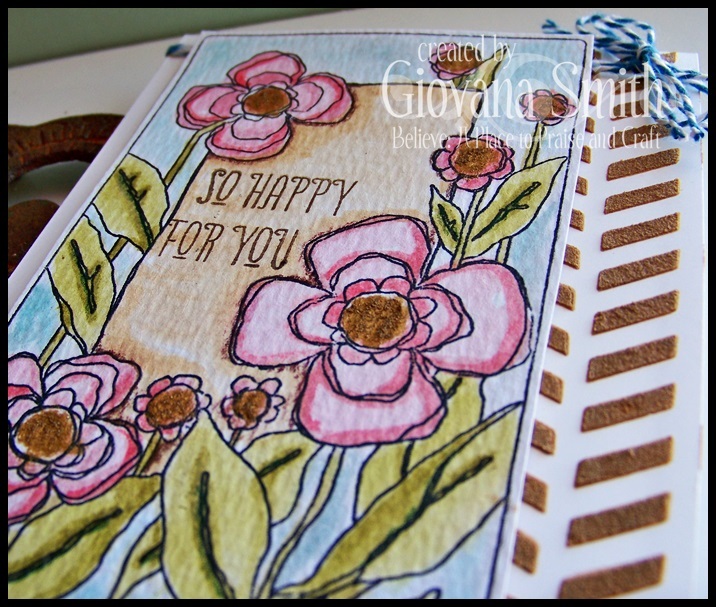 I love your beautiful watercolored card, Giovana!! I'm finishing up my entry now and will have it posted soon! Love your watercolored card Giovanni! So glad I was referred to your site by Sue L. Thanks Sue! Beautiful work with a very talented team! Beautiful example for this challenge! lovely card and other projects by DT for inspiration!